While waiting for the Greeks to arrive I had time to paint up a Hessian Regiment for my SYW/WAS Pragmatic Army. 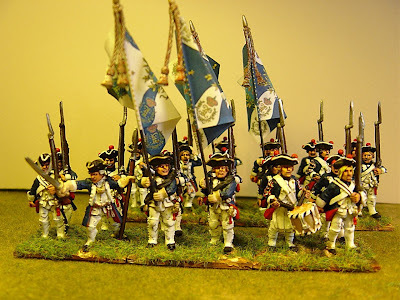 I've gone for the post 1760 organisation because a) the flags are nicer and b) the single battalion Regiments were enlarged and made into two small battalion Regiments. So these are just 12 figures per battalion (as against 18s for the British and Brunswickers and 26s for the Hanoverians) and their (weak) presence on the battlefield will force the wargamer to make some tactical decisions - just as Ferdinand had to. 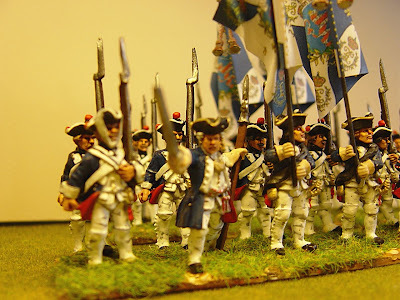 But, on the other hand, I will field these Hessians in brigades of 3 Regiments (72 figures total)so they will be just as strong as a Brunswick brigade, for example, of 72 figures as well. I think I recall reading somewhere (Mollo or Savary, I don't remember which) that the Hessians were considered more reliable than the Brunswickers. 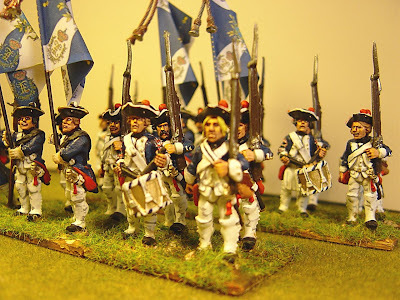 I also wanted to further differentiate these from Brunswickers so I will give all Hessians white gaiters, which was technically summer issue, though I suspect black was worn all year round. Lastly, I just wanted to mention that pictures of Crusader's new SYW French are up on North Star's website. When I saw them this morning I was hugely disappointed as they had turnbacks but after talking to Mark I'm happier now. 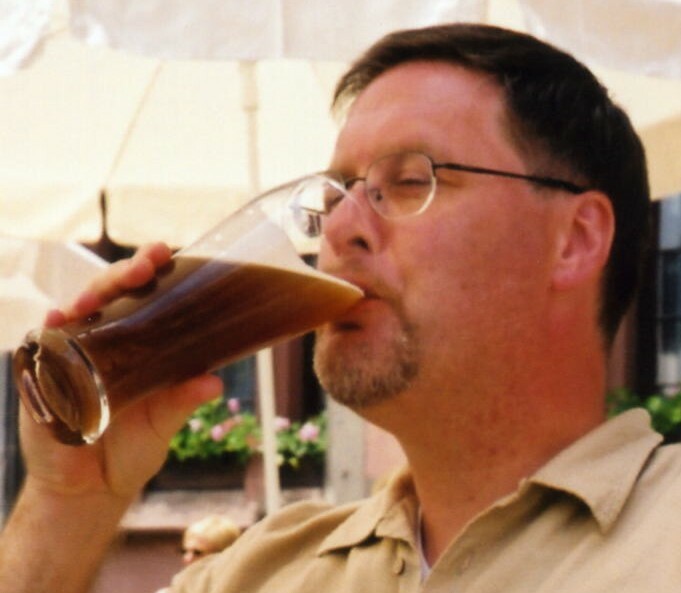 These are the first realease and are suitable for French 'Germans', 'Swiss' amd later war French themselves. The (more interesting, to me) figures in coats without turnbacks will be released (Mark says) early next year. Nice to see someone else interested in the Pragmatic army. I've just paid for a lot of Eureka Dutch WAS figures, so by next year I'll may be in a position to afford the Crusader French w/o turnbacks! I'm right now putting together an order of battle for the Pragmatic Army- including the Dutch- on my blog. Check in a few days and I may- if lucky- have some names for you.